This Holiday season the Ordway Center for the Performing Arts is home to the regional debut of A Christmas Story: The Musical. This beloved Christmas movie has been adapted for the stage by Broadway’s hottest new composing team, Benji Pasek and Justin Paul or better known as Pasek and Paul. After a world premiere at the 5th Avenue Theatre in Seattle in 2010, the show went on to play Broadway for a limited run at the Lunt-Fontanne Theatre in 2012. To date the show has had two National Tours and several regional premieres across the country. Longtime Twin Cities actor Gary Briggle, who portrays the Narrator/Jean Shepard, sat down with me to discuss what audiences can expect from A Christmas Story: The Musical, as well as some of his favorite Christmas memories and what he enjoys about this time of year. A Christmas Story is an iconic holiday movie. Are there any significant differences between the stage and film version, other than the musical aspect? Happily, the musical honors all of the favorite episodes, and even the unique language, of the movie. And, because it’s a musical, some characters and moments get the full Broadway song and dance treatment. Without giving too much away, the Leg Lamp ballet and the hilarious dream sequences involving Ralphie’s teacher, Miss Shields, are amazing to behold! The sparkling music also really enhances the holiday spirit of the story, while giving Ralphie’s Mother and The Old Man even more emotional dimension. In A Christmas Story, Ralphie will do anything to get his hands on that Red Ryder Carbine-Action 200-Shot Range Model Air Rifle. Did you have an item growing up that you would do anything it took to find that gift under the Christmas Tree? I remember hoping for ice skates and for an electric train set with all my heart! And then a race car set a few years later! The Rube Goldberg inspired Mousetrap was a big hit with me. And I got an amazing football game that vibrated the players down the field. And a fooseball-style hockey game …. the list goes on! My dear parents- I mean SANTA- was very generous to my sister and me. I portray Jean Shepherd, the narrator, so I’m recalling episodes from childhood at Christmastime in the 1940s in Hohman, Indiana. Jean is bright, energetic, warmly funny, with a unique vocabulary and storytelling style. He has a wondrous child-spirit about him as he relives his most important Yuletide season. He really gets inside the head and heart of Ralphie Parker, and reveals his great love for his family along the way. Most people probably were unable to catch the run of A Christmas Story, the Musical on Broadway in 2012. How would you describe this show to them as a musical compared to the movie we all know and love? This musical continues to evolve, and improve, with each new production, so this is the first time audiences will see this particular version of the show. I think audiences will be pleased that their favorite movie moments are being acted out live, onstage – while there are terrific surprises in store with the fantastically sung and danced production numbers. Do you feel any pressure in bringing a movie that is such a Christmas favorite to the stage? There’s always a responsibility to do the best work we’re capable of, but this is a beautiful show with much life and heart and spirit, so mostly it’s about getting such a complex and extravagant production to go smoothly. We’re working hard on the technical aspects – set changes, lighting, costume changes – to make the whole production go like clockwork. What do you hope the audiences take with them after seeing the show? The true spirit of the season is about love. Also, generously giving to one another, in heart and spirit, is the greatest gift. What are you excited for the audience to see? The fantastic choreography, dazzling scenery, lighting and wonderful costumes are all worth the price of admission alone. What are a few of your favorite Christmas movies/plays/musicals? I love “Mr. Magoo’s Christmas Carol” … and nearly every version of the original Dickens story, including the musical, “Scrooge!” My wife and I always watch Bergmann’s exquisite film, “Fanny and Alexander,” too. Truman Capote’s “A Christmas Memory” is deeply touching, as well. Wendy (Lehr) and I both cherish having performed in “Cinderella,” both here at the Ordway and at CTC. Reading Dylan Thomas’ “A Child’s Christmas in Wales” by the fire … with a glass of port and some Stilton cheese & walnuts … is very special to us. We listen to Handel’s “Messiah,” medieval/renaissance Christmas music, and always go to a midnight nativity service to worship. If you could bring another Holiday favorite movie to the stage, which movie would it be and why? Tim Burton’s “The Nightmare Before Christmas” would be incredible, don’t you think? 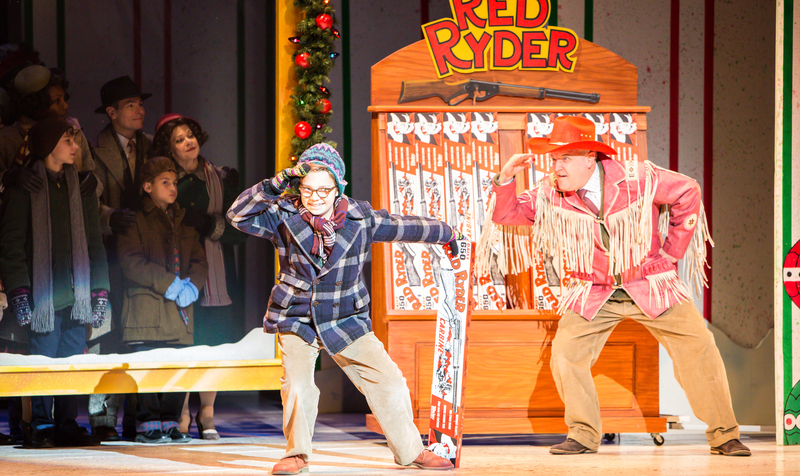 For more information on A Christmas Story: The Musical visit the show’s website.